When I was fortunate enough to meet Chef Tim Keller for the first time was Fall of 2008 in Ashland, Oregon. Tim was the Executive Chef at the Carriage House. As an appetizer that evening, we tried his onion rings that were dipped in a polenta batter and fried fast, hot and crispy, yet sweet inside. They were served with his tamarind catsup on the side, which was just the right combination of spices. The next day, we interviewed him and it was like a stand up comedy act. Then we got to see him in action preparing duck confit. I bring out his humor and passion, as when you read through Executive Chef Timothy Connan Keller’s interview, his sense of passion for life comes through, but not his sense of humor. It is there, and those who know him are fortunate to see and experience it. Now that he is Corporate Executive Chef for the renowned Harry & David Corporation, I wanted to interview Tim again and get an update. When it comes to passion, creativity and dedication, Executive Chef Timothy Keller ranks with other top chefs throughout the world. Chef Keller’s approach to cuisine is that of a true artist who finds the often subtle beauty of an ingredient or flavor and then creates a masterpiece. For more than twenty-five years, he has delighted and educated his guests and peers with his fascination, creativity and techniques in creating a perfect dish. As a young boy, Chef Keller grew up in the small town of Davis, in the heart of the Northern California farming industry. It was in this area that he learned the importance of organic farming, cheese making, and wine production. He immersed himself in the area’s aromas and flavors, with an approach that led him to the exciting and exacting world of food. Chef Keller continued with his hands-on education by working at several prominent San Francisco, California restaurants, as well as attending culinary school. He had the honor of working with Albert Tordjman at the Flying Saucer, for example. He appeared in the kitchen scenes in the movie Mrs. Doubtfire, which were filmed at Bridges Restaurant in Walnut Creek, California. He received a sterling write up in Bon Appetite magazine, and was commended for being an outstanding, creative and innovative chef. Chef Keller followed these experiences by opening his first restaurant, The Firefly, in Ashland, Oregon. The Firefly was quickly noted in a number of publications, such as the Oregonian, as “one of the most outstanding restaurants in the Northwest.” During this time, Keller continued to master his concept of combining traditional European cooking techniques and American-Northwest innovations. Other professional opportunities beckoned, and Chef Keller assumed the position of Executive Chef at the historic Jacksonville Inn in Jacksonville, Oregon. The Inn was rated as “Best Restaurant” for five years in a row. During this time period, Keller had the opportunity to prepare meals for President George W. Bush and President Bill Clinton. Keller then accepted a position at the Carriage House Restaurant, also in Jacksonville, where he had the opportunity to build a renowned restaurant from concept to implementation. These experiences led Chef Keller to establish himself as an imaginative, innovative and knowledgeable leader within the culinary arts community. In 2011, Keller became the Corporate Executive Chef for the renowned Harry and David Corporation, which is known world-wide for its fine chocolates, premier fruits and specialty foods. During this time, Keller has appeared on television food segments in Denver, Colorado, Birmingham, Alabama and Detroit, Michigan, where he has shared his own creative recipes and signature cooking style which incorporates many Harry and David outstanding products. To date, Chef Keller continues to impress with his energetic cuisine and outgoing personality. Maralyn: What was your family’s reaction to your career choice? Chef Keller: My family was very supportive in my decision to follow a career in food and hospitality. They knew I was very artistic, creative, and passionate, and a hard dedicated worker. My parents aren’t “foodies”, but they appreciate good food and service. When I was eleven, I joined a club that studied how to set dinner tables and serve food properly. They were aware very early on that I enjoyed the moments created at the dinner table. My father was only concerned with the amount of work it takes to succeed in this profession. His mother owned a restaurant and he saw firsthand the amount of dedication that’s required to sustain a well-executed restaurant. However, he knew that I too was committed to excellence and enjoyed pampering guests. Maralyn: When did you start showing an interest in cooking and how did you get started? Chef Keller: I became very interested in food at the early age of five, when my family hosted a foreign exchange student from Paris. My first recollection of her cooking, she prepared Crepe Suzette. Not only were the crepes incredibly tasty, but she had spelled our names into each one! I was treated by a beautiful French girl, and I thought she was a culinary sorceress! My next introduction with fine foods was with pate a choux, which some thirty-five years later is still very dear to my heart. Choux paste taught me that with very few ingredients, I could create fantastic snacks. I especially loved the buttery pillowy inside that we removed to allow room for the vanilla pastry cream. That first memory, buttery steam, succulent wisps of soft, warm pastry and that sensual rich flavor are embedded into my makeup. I also remember making popcorn balls when I was very young, maybe nine or ten, and “burning” the butter. I used the darkened butter and remember the flavor being life changing! It was my first introduction to beurre noisette and simply a revelation. I now was intrigued with how a food could change in flavor, and how something so simple could create a completely different flavor profile. From caramelizing the oranges in the crepes, the pate a choux and beurre noisette in my popcorn balls (I imagined they were planets), I was fascinated with ingredients and especially butter. As a boy, I grew up outside of San Francisco, California. I was immersed in outstanding agriculture, the fine wines of the Napa Valley, heavenly cheeses, dairy, and poultry. Also, their was exotic fish from Hawaii, the dungeness crab, sourdough bread and the amazing chefs of the city! It was in this grand area that I fell in love with food and dining. Sign me up! I was ready to attack full-time in restaurants at age fifteen. Maralyn: Did you do an apprenticeship or go to a culinary school? Chef Keller: I believe you can learn a great deal in both culinary schools and apprenticing, but I believe it’s of the utmost importance to find teachers and Chefs that drive your passion. Individuals who push themselves, continuing learning, inspire me to be great as well. As a chef, you need to enjoy the process, the challenges and the rewards, otherwise it’s the toughest job one can face. I have often said, the day I stop learning is the day I stop living, and that’s really the key, I believe. Always grow professionally and personally, they both go hand in hand. I had been working in restaurants for more than three years, when a sauté cook from a country club I was working at the time asked me if I would like to go to culinary school with him. I thought that sounded like a great idea. I had been pursuing fire technology courses and working on my bachelor’s degree at Sacramento City College, but was not too excited about it. Culinary school sounded like an exciting, fantastic idea, so I enrolled. While in school, we toured a local hotel and I quickly broke off from my group to fill out an application. I soon was working in one of the finest hotels in the San Francisco bay area. While working, I realized that I was learning more than in culinary school, but school was giving me contacts and credibility. I realized that I was now Sous Chef of a big hotel, but at culinary school, I was learning how to be clean shaven, punctual, observant, engaging and professional. During this time, I came to a huge realization, the sooner I could learn everything, the sooner I could be an executive chef. I knew I was pushing myself to the brink, but I was learning a tremendous amount of skills in many areas of the kitchen and the hospitality industry. Then I realized, this is an ever-changing art form and while there are traditional methods of cooking (that should always be remembered), there is an endless supply of information; always growing and changing as with languages and art. This gave me an even brighter eyed approach! 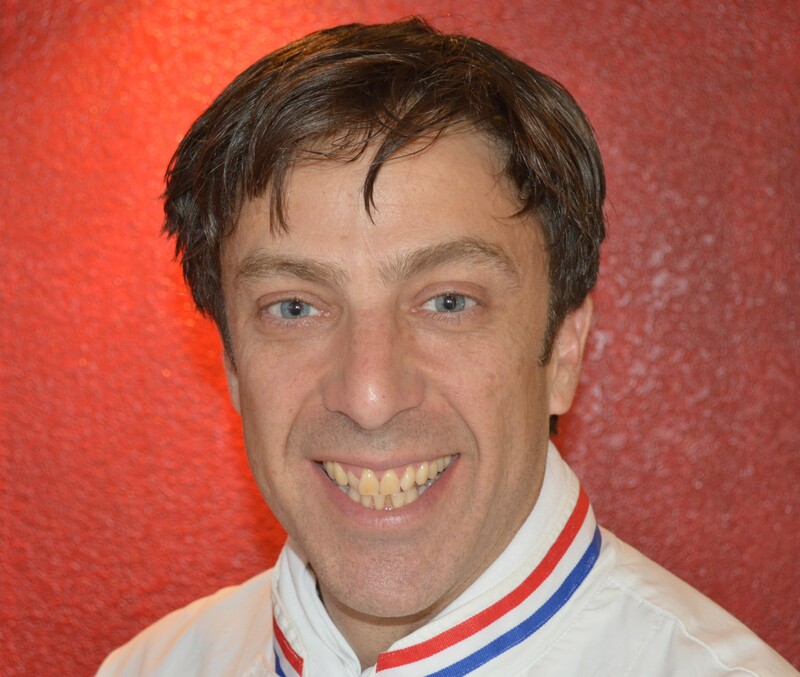 My last year of school, I went to work for Chef Albert Tordjman, a French Chef trained for many years by Chef Paul Bocuse. It was here that all my training (6 years) had come full circle. I was learning more in one day than I had learned in weeks at culinary school and other restaurants. Here is where I realized what true passion is. This restaurant, The Flying Saucer in San Francisco, is where I would find my inner passion! The schooling and years of working in the trade coincided beautifully, and I would now open my first restaurant, Firefly, in Oregon. Maralyn: What is your favorite comfort food and is there a particular reason? Chef Keller: I don’t really have a favorite traditional comfort food. I always love chips and salsa, that’s my go-to snack. Pizza, I love pizza, any pizza. French Fries, croissants, baguette and I especially enjoy ice cream. Duck! I am duck crazy! I remember walking my three year old daughter by the ducks at the park and pointing them out to her. She looked up at me and said, “They’re tasty”. That’s my girl! I love duck and have eaten my weight in confit easily. I enjoy all foods and really find the most comfort in those foods that conger up fond, warm and safe memories. That can simply include fantastic Champagne, fire and a view of a stormy ocean. I am really texture oriented. I love crunchy and I love smooth. I also love salty and bitter. Maralyn: Which is your favorite station in the kitchen, the hotline, pastry, etc.? Chef Keller: I enjoy preparing all foods, from the simplest to the sophisticated. A chef once told me “beauty in simplicity”. Being ingredient driven, I get excited around fantastic ingredients. I love dishes that require days of preparation and many layers of flavor. What really inspire me are new techniques. I love cooking sous-vide and have a blast working with liquid nitrogen. I like feeling as if I am a child in a laboratory of foods. Maralyn: How do you personally view presentation? Chef Keller: Presentation is very important to me; I want to reflect my creativity and personality throughout my dishes. Like an artist, I want you to be able to recognize my food. An art lover can recognize a Picasso or a Monet instantly, and I hope to convey the same visual message to my guests. I am not so worried if this should go here or there, I want the dish to be mine. I want each dish to be a reflection of me, my individuality and my spirit. I obviously trade ideas with other chefs, but I never want to copy. I might share a technique, but I want to make it visually mine. Like music or painting, there are only so many colors, so many notes, it is individuals sharing their emotions that touch us. Maralyn: What is your favorite cooking utensil? Chef Keller: My fingers! I also love tweezers, but just because they make me feel like a scientist. I always have a spoon in my pocket, large enough to scoop and small enough to taste. Spiders, Japanese mandolins, tongs, wooden spoons, they all are much appreciated. But when all else fails, the fingers. Maralyn: Anything else you would like to share about being a chef? Chef Keller: Stay focused. Eat right! Sleep and be tolerant and respectful of your staff. I have often regretted how I have treated my staff in the past. I always thought people should be as passionate as me, then I realized, most likely are. But they have other passions, mine are in the kitchen. Watch for the pitfall of being so devoted to your work, that you lose perspective of other aspects. Maralyn: If you could provide one or two tips for prospective chefs, what would it be? Chef Keller: I have always thought the best ways to learn are by reading, traveling and doing. Do all three as much as you can! Maralyn: What are the highlights of your career, your “ah ha” or “wow” moments? Chef Keller: My most enjoyable moments come from guests enjoying their experience. I have a difficult time accepting praise, especially from myself. My career has been full of moments of greatness, opening restaurants, creating over hundreds of expertly crafted dishes and I guess it’s the sum of the parts that I appreciate. I look back at my career thus far, pat myself on the back for a moment and get back to creating. I really don’t stop, I am continually thinking of ideas, not just food related concepts, but within every aspect imaginable. I can’t help being proud when a favorable review or article is printed, validating the hard work and commitment, not only of what I have accomplished, but also of my collective team. Maralyn: When you go out, where do you go to eat? Chef Keller: I love eating at very fine restaurants; I love all of Thomas Keller’s restaurants, Bouchon, French Laundry and Ad Hoc. I have enjoyed many great meals at Fleur d Lys, Cyrus and The Girl in The Fig. All of these are San Francisco Bay area landmarks. Le Pigeon, Imperial, The Benson, Blue Star Donuts and anything else in Portland, Oregon! I might grab a burrito or some Thai here and there, but for the most part, I really enjoy my own food. I love eating out and being served, having someone else take care of the dishes, but I would much rather eat in and spend my money on the vinyl records I play during dinner. I am spoiled with flavor. We refer to our smoke alarms as flavor detectors. Our house smells wonderfully smoky at times. Maralyn: How do you work with local growers? Chef Keller: Working with local farmers can be a great collaboration, where we spring board off each other’s ideas, elevating our own products, practices and approach. I also try to minimize the amount of plastic and cardboard being used. I am often set back by the amount of trash a restaurant can generate. If I can create less garbage I will. By having local products available, this means I can reuse bins, jars, bags and boxes. Maralyn: Do you focus on using local products? Chef Keller: This was a question brought up to me years ago, the local organic thing and I answered that writer with this statement: Fine chefs have been using local and organic products forever. That was our secret weapon. The average consumer would shop at grocery stores and the occasional fruit stand. Great chefs have always had fantastic connections directly with these producers. This is why restaurants were so special; you simply couldn’t get as many fine ingredients as these chefs. I work with many local farmers and artisan food makers. I love creating relationships with people who want to try new approaches and ideas. Often, the products made individually are far superior than large company produced products. Maralyn: Do you have a favorite dessert? Chef Keller: I can’t commit to a favorite, I really love everything! Éclairs, ice cream, crème brule, chocolate, fruit tarts, tortes, sabayon, fresh fruit and pretty much anything else. I remember eating at Thomas Keller’s French Laundry. I had just had the twelve-course meal and the server asked me if he could get anything else. I literally wanted to do the whole dinner again. That would have been a fantastic dessert. Food for me is about the moment. I want the dish to compliment the mood. Sure, there are standbys, but what will caress the emotions of the moment; for instance, ice cream in the sun, a warm tart by the fire or some marshmallows over the coals. The foods I eat paint pictures in my head. Maralyn: Do you cook at home a lot? Chef Keller: I cook every meal at home! I have to eat good, fresh meals every day. I often make three meals a day. I bake bread, make ice cream, BBQ, tons of pizza. I believe the more good energy is put into your food, the more good energy is put into you. And, I am a food snob who can’t afford to feed a family of four at fine restaurants. So I bring the restaurant to us. I’m the cook, the waiter, dishwasher and usually the entertainment. Also, the main reason I enjoy cooking at home is that I know I am creating lasting memories with my family. Maralyn: Would you share a recipe with us? Chef Keller: This technique of “solidifying” a liquid has become a trademark component in many of my dishes.I made this recipe in reference to the spring celebrations in Japan. Sakura translates to cherry blossom, and this is my take on a maki roll. I use agar agar, which is very popular in Asia, and fuse it with French chevre. The flavor is delicate, light, bright and rich all together, balanced like sushi and perfect for spring entertaining. For the candied blossoms, preheat oven at 100 Fahrenheit or a prepared dehydrator. 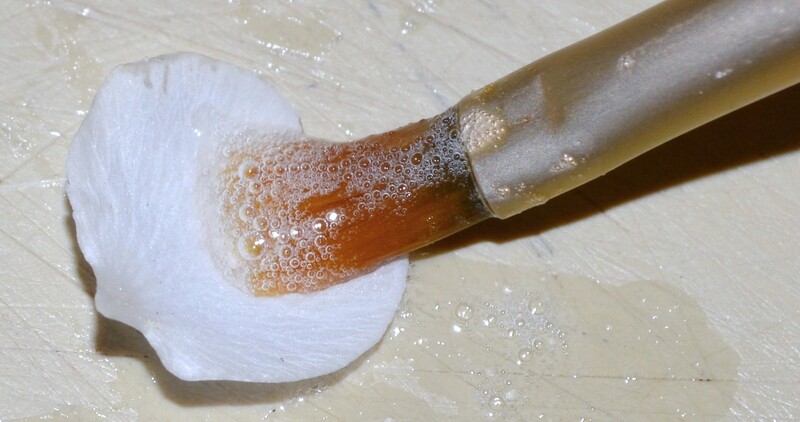 Mix the egg white and sugar to create a sugar “paint”. Carefully remove the petals from the blossoms. Have a dehydrating pan, a set of tweezers and a paintbrush for assembly. Using a very small amount of paint, paint each blossom petal, front and back. 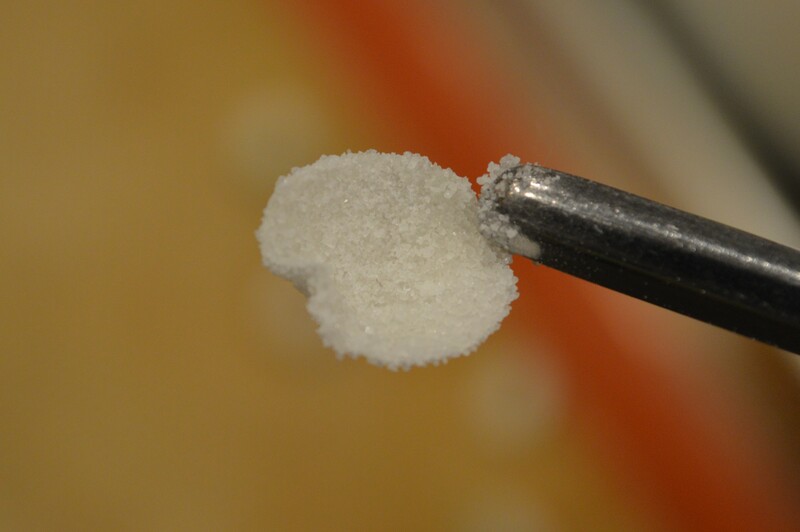 Drop into the tablespoon sugar, remove with tweezers and place on dehydrating pan. Candy all the petals and dehydrate, using manufacturer settings. Dehydrate in a convection oven set at 100 Fahrenheit for 1 day. Line a small sheet pan with acetate film. This preparation can work on any flat cool surface, but the acetate is a bit easier to work with and creates a beautiful shine to the film. Portion the goat cheese into 1/4 ounce cubes, cover and refrigerate. Place the cherry juice, sugar and agar agar into a small saucepot. Whisk well and bring liquid to a boil. Turn the heat off immediately and pour onto the acetate sheet. Refrigerate until firm. 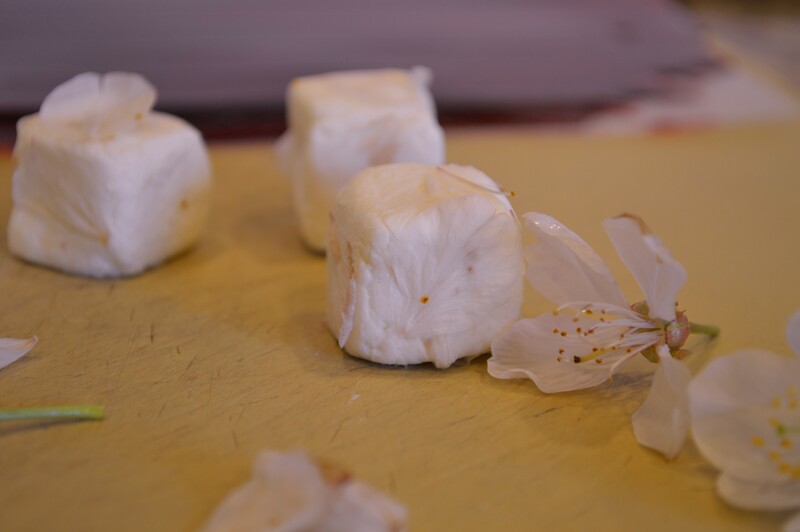 Remove the petals from 15 blossoms and adhere to the cubes of chevre. 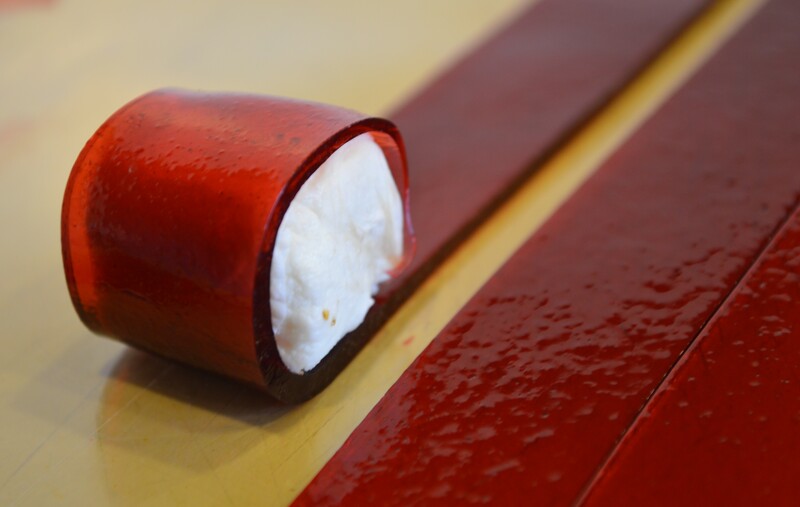 Cut the cherry film the width of cheese and 6-7 inches in length. Place the chevre on one end of the strip and firmly roll up, allowing the seam to be hidden on the bottom. Plate the sakuramaki on a platter, garnish with one candied petal and one fresh blossom per maki. Chef Keller also shared one of his recipes for focaccia crackers that go especially well with this dish. Place the water, yeast and honey in a small mixer with a hook attachment, and mix on low for one minute. Add the salt and oil and mix for an additional one minute. Add the flour, mix and knead on low for ten minutes. Place dough in oiled bowl and rise until doubled in size. Preheat oven to 350 degrees Fahrenheit. Add one tablespoon of the reserved olive oil to a half sheet pan, gently turn the bowl with dough upside down over the pan and release the dough from the bowl. It should pop right out on its own, then roll dough to fit pan. Use a fork and put holes into the dough, roughly 1/4” deep. Brush the remaining olive oil across the dough and let stand for 20 minutes. Place dough in oven and bake for 25-30 minutes. Let cool and slice the dough in thirds and freeze. Place frozen focaccia onto a large cutting board and defrost until the bread can be sliced without cracking. Slice very thin and place on half sheet pan, bake for 15 minutes or until lightly brown. Let cool and keep tightly covered until served. Chef Keller will be sharing some of his tasty recipes from Harry & David in the June issue of Luxe Beat Magazine. We are also happy to announce that Chef Keller will be a regular contributor to Luxe Beat Magazine. You can follow Chef Keller on Twitter or Instagram –@Chef_TKeller.